I wanted to knock out a few more quick projects for some instant gratification and this B5354 knit top fit the bill. It's made out purple rayon jersey knit. I bought this fabric a long time ago at Joann's when I was just starting to sew with knits. 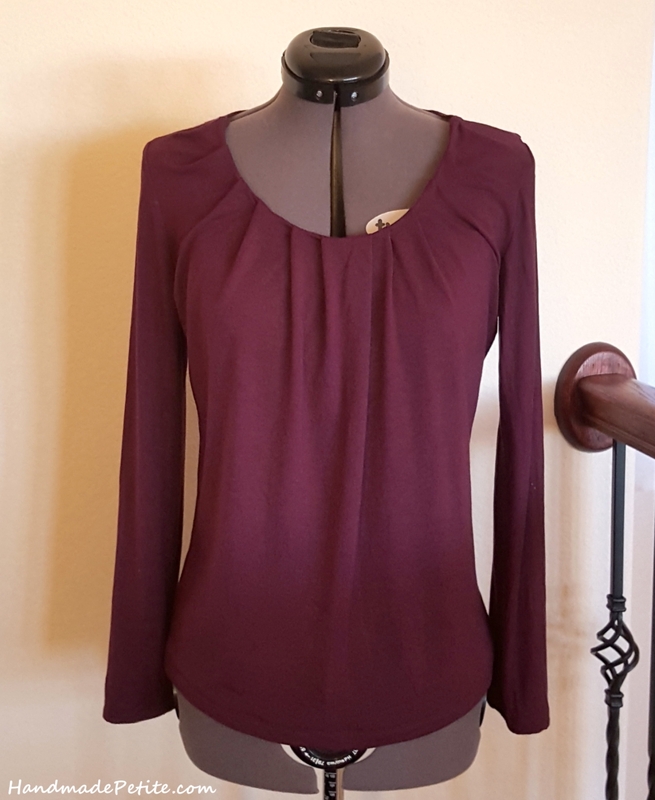 It's nice and soft, but unfortunately I found out last time I made a garment with the same fabric that it started to pill very quickly so I didn't want to make something very time consuming that I would feel bad about getting rid of if it started looking unsightly. B5354 is a basic knit top with a pleated neck detail. This is view D with long sleeves. I didn't actually realize this until I made this pattern the second time, but I missed the part in the instructions that said to sew the pleats vertically first and just basted them at the top. It still looks fine and doesn't change the rest of the pattern, but the pleats look less pronounced. The only changes I made intentionally were to narrow the pattern at the waist a bit and change the order of construction for the sleeves. I like to sew in the sleeves flat right after the front and back pieces are joined at the shoulder. Then I sew from the edge of the sleeve all the way down the side seam in one go. This just a personal preference - it feels easier and faster to me than setting the sleeve in, but the instructions are clear if you want to follow them. Since this is a stretch knit, I constructed everything using my serger and finished the edges on the coverstitch machine. When I was done with the construction, I went back and sewed the facing to the inside of the pleats by hand because it was showing despite the under-stitching. According to other reviews of this pattern, this was a common issue. All in all I was happy with the pattern. It's quick to make, comfortable and had a bit of detail to make it stand out compared to plain scoopneck tees. The only complaint is as with most Butternick patterns, it runs a bit large. According to the envelope I should be between 10 and 12. I made size 6, but think 4 in would have been perfect for this stretchy fabric if the pattern went smaller. Since I already had the pattern out and coverstitch machine set up, I decided to make another variation of the same pattern. 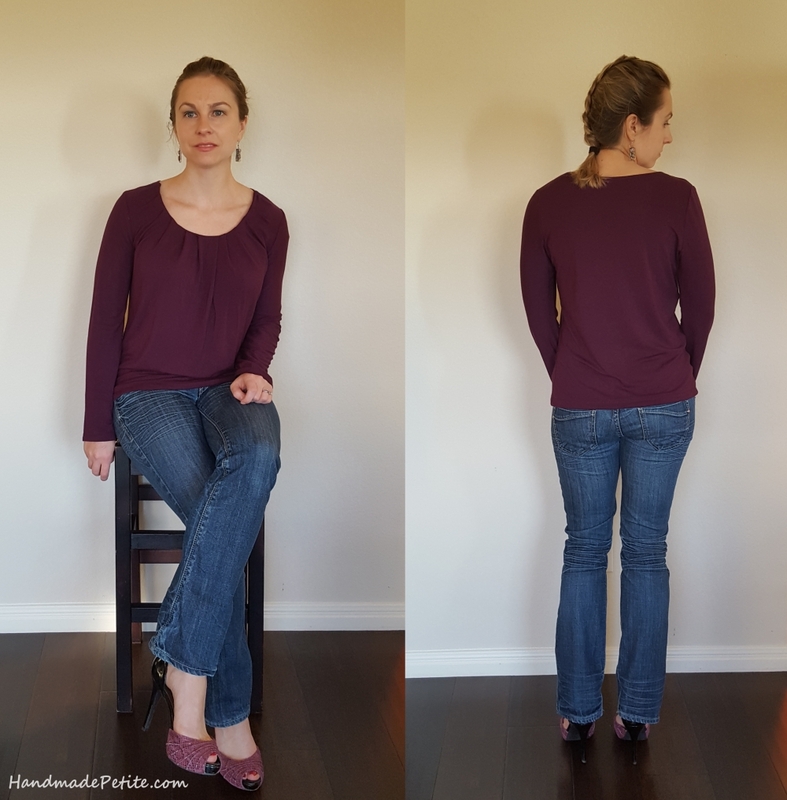 I love versatile knit tops that can be casual or dressy, but I got rid of a lot of my old tops recently and have been on a hunt for sewing patterns to replace them. Even though we're still in the middle of winter and making a short sleeve top seems impractical, in Austin it'll be 70's in matter of days again. Plus, this pattern was still fresh in my head and it's so much faster to make a garment twice in row than digging it out months from now. 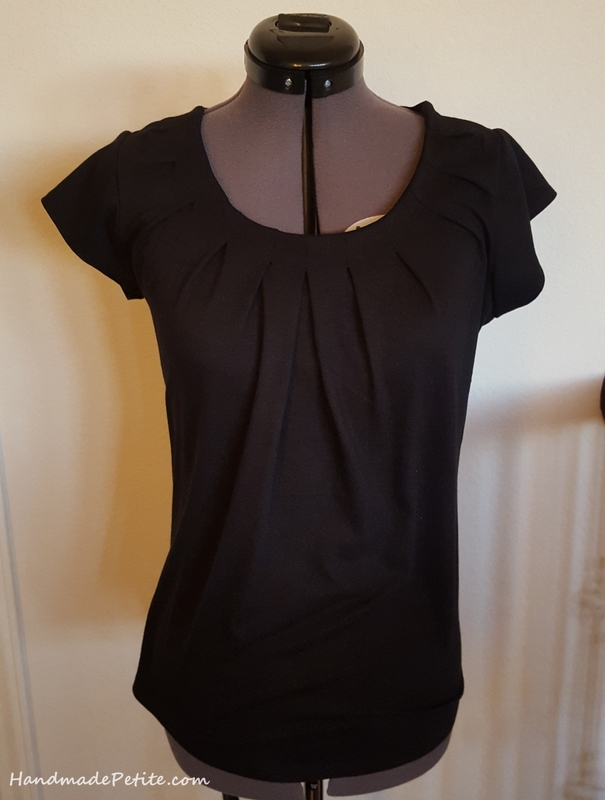 This time I used black jersey knit from Fabric Mart and made a short sleeve version. What a difference in quality of fabric! 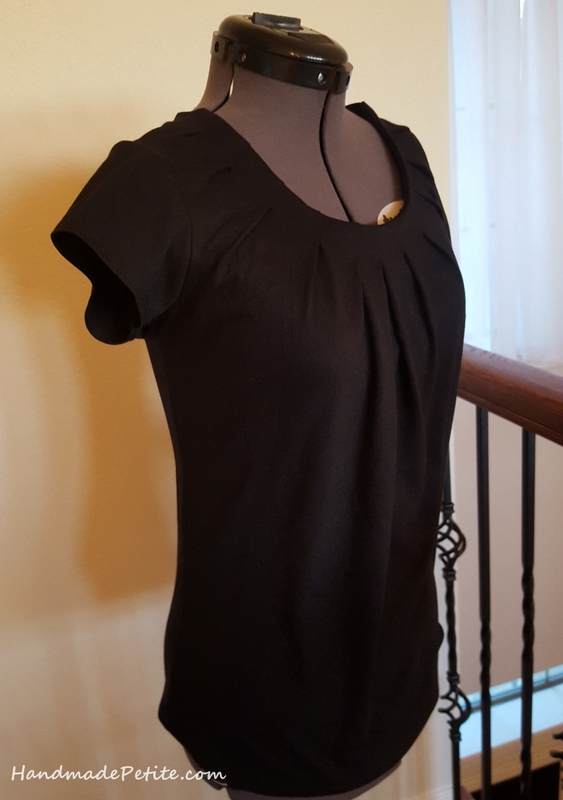 This jersey is super easy to work with, has great recovery and I know it holds up well because I used it before for this ruffled tank.This fabric doesn't stretch as much on it's own as the rayon jersey so I actually didn't end up narrowing it as much and it's closer to pattern size 6. Everything else was identical to the first top, except I actually followed directions this time and stitched the pleats so you can see they're more pronounced here. The rest was identical to the first top, including having to hand-stitch the facing down to the pleats. I'm pretty sure I'll make this pattern again in the future.